College Coach? Click here to view all of Lea's information. Softball has been a major impact on my life for the past 11 years. 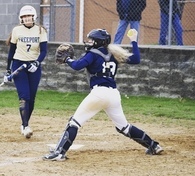 Some of the highlights of my softball career are winning the section title my freshman year and winning 6 tournaments in the past two years with the Pittsburgh Predators organization. My goals is to play for a successful team at the collegiate level and further my education in the field of law or business management/economics. My primary positions are catching and 3rd base, however, I am also a utility player. I am determined to be the best student and athlete I can be. I lead by example and support my teammates. I work hard on the softball field and in the classroom. I am a high honors student and am involved in many school clubs. Softball has been a major impact on my life and is my passion. I hope to continue my academic and athletic career at a university that is a great fit for me. Notes: (stats only for first 4 tournaments) 1st Cedar Point Coaster Classic, 2nd Summer Fest, 2 MVP awards at the All Sanctioned World Series, and 1st Wounded Warrior Benefit Tournament. Notes: This season our team took 3rd place at the USSSA- Memorial Day Super NIT. Also took 1st place at NSA- Summer Open and NSA- ROC Elite Summer Bash. Participating in the hitting and catching sessions of the camp. Yes. American Cultures AP Class. AP Language. Student of the Month picked by teachers and faculty of the district.